Will Russia and China build an SCO-based joint missile defence system? Russia and China could become the driving force in the area of missile defence. Russia and China may create a unified missile defence system for the Shanghai Cooperation Organization. That's the conclusion of experts speaking at a forum dedicated to the US deployment of the THAAD anti-ballistic missile system in South Korea. What would the Russian-Chinese system look like? Sputnik investigates. On Monday, experts in Moscow and Beijing spoke via video conference on the implications for regional security of the US deployment of missile defence systems in South Korea. And while the forum focused mostly on political and military implications of the THAAD deployment, experts also intrigued observers by indicating that it was possible for Russia and China to join together to create a single missile defence shield over the entirety of the Shanghai Cooperation Organization, the political, economic and military organization involving much of eastern Eurasia. Regarding the THAAD deployment, Moscow has repeatedly indicated that it was categorically opposed to the move. THAAD, capable of monitoring ballistic and aerial targets at distances of up to 1,500 km, is expected to give the US military the capability to 'see' into the territory of the Russian Federation, and even further into that of China. Cold War 2.0 back in Northeast Asian region? Speaking at the video conference on Monday, Vladimir Petrovsky, a senior researcher at the Moscow-based Center for the Studies and Forecasting of Russia-China Relations at the Institute for Far Eastern Studies, explained that the potential for a joint missile defence shield exists. Moreover, such a shield would be entirely appropriate given recent US moves, from its deployment of missile shield components in Eastern Europe to the deployment of THAAD in South Korea. "Russia and China could become the driving force in the area of missile defence. Special attention should be paid to the land-based interception systems which we have at our disposal," the analyst said. Recently, the analyst recalled, Japan, South Korea and the United States conducted drills practicing the interception of ballistic missiles using the maritime-based US Aegis system. The appropriate response from Moscow and Beijing, according to Petrovsky, would be for the two countries' air defence forces to conduct similar joint exercises at the Ashuluk range in Russia's Astrakhan region. Asked to comment on Petrovsky's words, experts speaking to the independent online news and analysis hub Svobodnaya Pressa indicated that a joint missile defence system was entirely within the realm of possibility. Vladimir Evseev, the deputy director at the CIS Institute, indicated that he believes the creation of a united anti-missile defence system is definitely possible. "Just to specify, we are talking about an anti-missile defence system, not air defence in general. In May, Russia and China staged their first joint missile defence exercises using computer simulations in Moscow. This was the first step in a plan to create a joint missile defence system. The next could be to gather real-world experience on the interception of ballistic targets, for example, at the Ashuluk range." 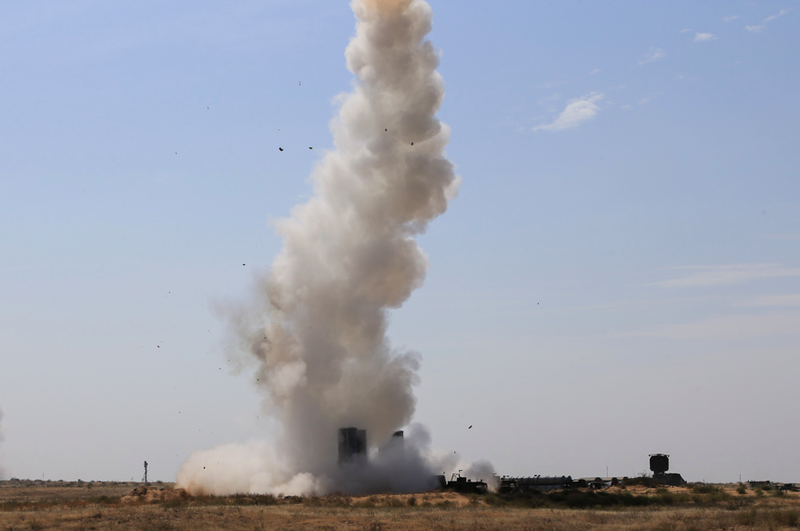 The expert noted that at present, China has two battalions of S-300PMU surface-to-air missile systems, two regiments of S-300PMU-1s and four regiments of S-300PMU-2s. Moreover, they have their own domestically developed SAM system – the HQ-9, created on the basis of its Russian analogues. This includes a maritime variant of the complex – the HHQ-9. "In addition, China has an analogue to the American Aegis system – built on the basis of France's Thomson-CSF TAVITA." These systems are capable of intercepting ballistic targets at altitudes of up to 30 km and speeds of 1.5-2 km per second. Russia soon plans to supply Beijing with the S-400 Triumf; that system's basic missiles are also capable of intercepting targets at altitudes of about 30 km, but at higher precision. Russian defence systems, in addition to the S-300 and S-400, also include the Moscow Air Defence System's A-135 missile, capable of intercepting enemy missiles at altitudes of up to 60 km. "With regard to missile attack early warning systems (EWS), that of Russia is of course more advanced, and includes ground-based early warning radar (including the Daryal, Volga, Don-2N and Voronezh radar systems), plus the group of satellites in high elliptical and geostationary orbit." Effectively, Evseev noted that "based on available funds, we could carry out exercises and make an attempt to intercept a ballistic target over Russian territory using joint calculations and, later on, eventually strive for the creation of collective missile defence." "Such a move would serve as an effective response to US plans to deploy elements of missile defence in space. It is space-based ABM specifically which threatens to provide guaranteed interception – during the active phase of the missile's flight. And at this stage it is not necessary to make choices about the real targets within a cloud of decoys, as is the case when interception is carried out during the passive phase," nearer to the ground. Ultimately, the analyst warned, if the US continues to develop its space-based missile defence components, "the only effective means against such a system would be the use of anti-satellite weapons. We know that China has tested with such systems, and we have similar designs, even if they are not widely advertised. In my view, we can only respond to Washington through the combination of military and diplomatic efforts. Diplomacy alone will not stop the construction of the US missile defence system." For his part, Vasily Kashin, a senior researcher at the Institute of Far Eastern Studies, noted that Russian-Chinese cooperation in the field of missile defence is possibile, although a full-scale joint shield is unlikely. At the same time, Kashin indicated, "creating a collective missile defence system in the framework of the SCO is not possible by definition, given the specifics of the organization and the policies of its members. For example, a country like Uzbekistan may have its own dissenting opinion on the issue, not to mention the positions of India and Pakistan," set to join the SCO in 2017. "As for collective missile defence between Russia and China, it is an unlikely scenario, but possible, given that cooperation in this field already exists. China is now in the process of creating an early warning system, and is developing a strategy for missile defence, including theater missile defence." In this sense, Kashin suggested, "Beijing is naturally interested in our experience and, possibly, in an automated system of data exchange. As we know, missiles, if they begin their flight from the continental United States, will fly to Russia and China over the North Pole. In principle, the exchange of data in the event of such a global strike may be of interest to our countries. Something of the kind has already been implemented by the US: The Americans receive real-time data from the early warning radar they sold to Taiwan, [and] the same thing seems likely with South Korea." Still, according to the analyst, a genuine joint Russian-Chinese system of missile defence will most likely remain on the drawing board.